Is Spain safe from fires like the one at the Grenfell Tower in London? The fire at the 24-storey Grenfell Tower has reopened the debate over the importance of safety and fire protection. According to the latest information, the coating of the facade with polyethylene panels, a highly flammable material, fanned the fire. Also, the alarm system did not work properly. 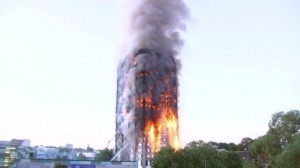 It is clear that, in one of the countries with the highest demands in its building legislation, something failed to allow this material to be installed and the maintenance of fire systems showed deficiencies. It is necessary to consider whether this tragedy could happen in Spain. “Facing events such as the one in London, we would have to take into account the elements of passive and active fire protection in buildings, regulated in the Technical Building Code (CTE),” explains Javier Méndez, director of the Technical Office Of the Colegio de Aparejadores y Arquitectos Técnicos de Madrid (COAATM). Regarding the passive protection, and in relation to the materials used, where the polyethylene would be included, the CTE uses two characteristics to try to solve the risk to the fire: the reaction and the resistance. It should be specified that what is regulated is the classification of the products in terms of their behavior in fire, and not the type of material. “Therefore,” notes Mendez, “the reaction and resistance to fire of the materials used in the building must be justified and must comply with the classification established in the CTE for a specific material and with an specific use “. If they respond in the right way, they are valid for construction. In addition, active fire protection includes equipment and devices installed to detect, warn and even extinguish the fire (detectors, alarms, sprinklers or fire extinguishers). And it is very important to know that the installation of the best systems are not usefull if they do not work when there is a fire. ”The key to the effectiveness of a system is carrying out the maintenance periodically by accredited companies, according to the legislation,” warns Antonio Tortosa, vice president of the Spanish Association of Fire Protection Societies (Tecnifuego-Aespi).